Putting together Ikea furniture is a cruel test of mettle that most of us must brave sooner or later, but science has (finally) done something worthwhile by creating an Ikea-furniture-assembling robot. The Distributed Robotics Laboratory at MIT calls it the “IkeaBot.” As the name suggests, it’s a robot that slaps together your Ikea furniture, allowing you the luxury of watching while sipping coffee and being grateful. As you can see in the team's video, the robot is fully automated and doesn’t need coaxing or prodding by humans to get the job done. 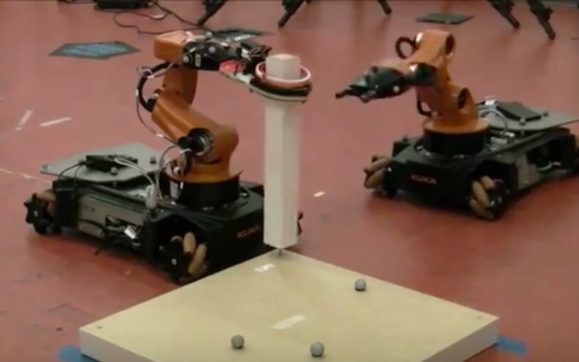 In fact, the team told the 2013 IEEE International Conference on Robotics and Automation, "We believe that this paper represents the ﬁrst autonomous robotic system to assemble a piece of IKEA furniture." The software behind the robot’s furniture-assembly prowess uses “geometric reasoning” and a “symbolic planner” rather than relying on the paper directions (like its human overlords do). This advanced programming, combined with a sophisticated system of physical manipulation and gripping called the “Torq Gripper” (two counter-rotating wheels joined by rubber bands), allows your mechanical pal to get the job done in ten minutes or less. Alas, the automaton isn’t commercially available yet, so newlyweds, college students and divorced men will have to keep at it on their own. For now.